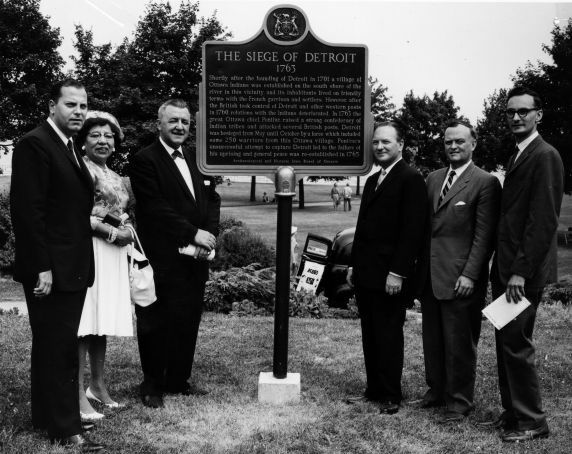 Representatives of regional organizations pose before the historical marker for the "Siege of Detroit" in Windsor, Ontario. Mayor Jerome Cavanagh and (left to right) Mrs. Clarence Aikens, a representative of the North American Indian Association, Mayor Michael J. Patrick of Windsor, William Murdoch, Speaker of the Ontario Legislature, Professor J.M.S. Careless, a member of the province’s Historic Sites Board, and R. Alan Douglas, President of the Essex County Historical Association.